I do not like sunscreen. It is greasy, it makes makeup change colors, it makes me breakout. 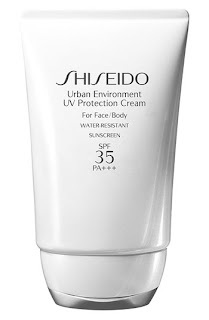 But then I found Shiseido's Urban Environment UV Protection Cream and all of my anger towards sunscreen faded..along with my nasty sunspots. This is quite possibly the lightest sunscreen I have ever used, and I have used a lot of sunscreen. Wearing an SPF is a must, so I am honestly grateful to have found one that actually makes my skin look and feel better. This is non-greasy, light and contains ingredients to hydrate and protect your skin from the pollutants we encounter outdoors. It's fabulous, and at $30 for almost 2oz it is affordable as well. I have been wearing it under L'Oréal's True Match foundation for the last month and it does not make the foundation pill or change color (pilling is explained here). • Hydro-Restoring Complex: Contains nourishing amino acids that naturally exist in the skin to provide intense moisture. • Thiotaurine: Protects against oxidative stressors found in daily life. • Rose Apple Leaf Extract: Prevents DNA damage that can lead to skin cancer and weakening of immune system. • Scutellaria Baicalensis Root Extract: Protects against damage to fibroblasts.